Why did I receive an email regarding changes for the 1098-T in 2018? Student Financial Services wants to make you aware of a significant Internal Revenue Service (IRS) mandated change to the 1098-T tax form for tax year 2018. Depending on your income (or your family’s income, if you are a dependent), whether you were considered full or half-time enrolled, and the amount of your qualified educational expenses for the year, you may be eligible for a federal education tax credit. You can find detailed information about claiming education tax credits in IRS Publication 970 on page 9. Beginning with tax year 2018, the IRS is requiring all schools to report amounts paid from January 1, 2018 – December 31, 2018 for qualified tuition and related expenses in Box 1 (Payments Received) instead of reporting qualified charges billed in Box 2 (Charges Billed). When you receive your 2018 1098-T tax form, Box 1 will be populated and Box 2 will be blank. Box 5 (Grants and Scholarships), Box 6 (Adjustments to scholarships & grants) and prior year tax forms will not be impacted by the new rules. Due to the change in reporting method, there will be no adjustments listed on the 2018 tax form in Box 4 (Adjustments made for a prior year). Beginning with the 2019 1098-T tax form, adjustments to payments received (Box 1) will be reflected in Box 4. 2018: 1098-T Box 1- The 12/1/17 payment would not be included on the 2018 1098-T form since the payment was made in tax year 2017. 2017:1098-T Box 1 – The box would be zero and Box 2 would include the amount of qualified tuition and related expenses charged for spring 2018 since it was due on 12/1/17 and was in tax year 2017. 2018: 1098-T Box 1 & Box 5- Any grants and scholarships disbursed in 2018 for spring 2018 qualified tuition and related expenses would appear on the 2018 1098-T in Box 1 & Box 5. 2018:1098-T Box 1 -The summer payment for qualified summer tuition and related expenses would be included in Box 1 since the payment was made in tax year 2018 for the summer 2018 term. 2018:1098-T Box 1 & Box 5 – Any grants and scholarships disbursed in 2018 for summer qualified tuition and related expenses would appear on the 2018 1098-T in Box 1 & Box 5. Scenario 3: Spring 2019 tuition and fees are due on 12/1/18 and paid on 12/15/18. 2018:1098-T Box 1 – The spring 2019 qualified tuition and fees paid in 2018 would be included in Box 1 since the payment was made in 2018. 2019:1098-T Box 1 & Box 5 – The spring 2019 grants and scholarships disbursed in January 2019 for spring 2019 would appear on the 2019 1098-T in Box 1 & Box 5 since they occurred in tax year 2019. 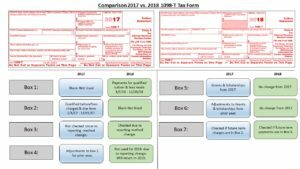 Can you highlight the changes for the 2018 tax year? Each year by January 31, Wake Forest University makes available via WIN (student must give online consent) or mails an IRS Form 1098-T to all students who had qualified tuition and other related educational expenses billed to them during the previous calendar year. Beginning with tax year 2018, the 1098-T reports amounts paid for qualified tuition and educational expenses for the tax year (Box 1). For years prior to 2018, the University reported qualified amounts billed in Box 2. The Scholarships and Grants (Box 5) are reported in the tax year that they were disbursed to the student’s account. For example, the 2018 1098-T Form would list spring 2018 financial aid (disbursed by the Office of Financial Aid the first day of classes-January 2018) and fall 2018 financial aid (disbursed by the Office of Financial Aid the first day of classes-August 2018). Students and authorized payers can view their student account history by visiting DEAC which can assist them in determining amounts paid in a tax year. Match up the specific charges for 2018 semesters (spring 2018, summer 2018, fall 2018) with scholarships paid for those same semesters. Please refer to IRS Publication 970, Tax Benefits for Education for additional resources. The Tax Treatment of Scholarship and Fellowship Payments table is located within that publication. This website is informational only and should not be considered as tax opinion or advice. 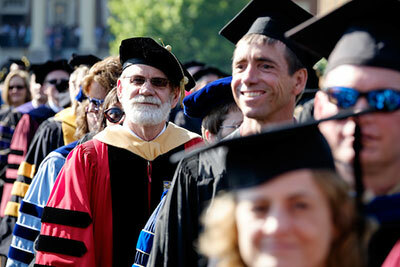 It serves to alert students that they may be eligible for federal income tax education credits. Receipt of Form 1098-T does not indicate eligibility for the tax credit. IMPORTANT: It is the responsibility of each taxpayer to determine eligibility for the credits and how to calculate them. How do I view my 1098-T online via WIN or remove consent? To provide (or remove) consent, click on the ‘1098-T Electronic Consent’ link. In order to provide consent, read the consent, click the checkbox and then press the ‘Submit’ button. To remove consent, uncheck the checkbox and press the ‘Submit’ button. Once consent has been submitted or the user selected ‘1098-T Tax Form’ from the ‘Personal’ menu, the user must select the tax year. (a) Print directly from your browser and change the page settings to print in landscape orientation. (b)Copy and paste the page into a document editor (Microsoft Word, Google Docs, etc.) and print from there. How do I grant consent to third parties (parents) to access my 1098-T online? 1- Grant consent to view your 1098-T electronically via WIN. 2- Establish proxy access for parents via WIN. Mozilla FireFox is the preferred browser for Proxy Management and Access. The Proxy Access System is available to all individuals who have been established as a proxy and have entered their credentials. If you would like proxy access, you must contact your student. Wake Forest University students can grant others access to view certain pieces of information that is normally available in their WIN account. This is termed granting “proxy access.” The other person is referred to as the “proxy.” The most common scenario is for a student to grant a parent or spouse access to his/her information; however, the student can choose anyone who has an e-mail address. 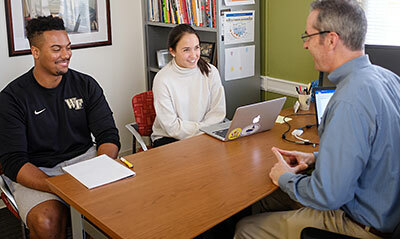 By granting proxy access, the student is giving Wake Forest permission to share the selected information with that individual. This permission is necessary to comply with the Family Educational Rights and Privacy Act (FERPA). The proxy/student relationship is controlled by the student. Only the student can create proxy user accounts and assign access to specific pages within WIN. Proxy users can potentially view items such as a student’s 1098-T tax form and/or holds on the student account. The student can reset a PIN for his/her proxy and can also choose to stop proxy access to his/her information. Requests to access student academic information and to become a proxy should be made directly to the student. You can set-up a proxy to have access to view your 1098-T Tax form and holds. Once you have finished the set-up process, the ‘History’ tab will allow you to view the past authorizations you have approved or disabled for your proxy. Once you have finished the set-up process, the ‘Communication’ tab will show the e-mails that have been previously sent to your proxy. You will be able to resend any e-mails listed. Questions about the information you are viewing should be directed to the student. Your temporary login and PIN are only valid for 5 days from the date a student creates your account. Please set-up permanent credentials within that period of time. To access the Wake Forest University Proxy System, after proxy set-up has been completed, you may log in at the Proxy Access Homepage. 1) Print directly from your browser and change the page settings to print in landscape orientation. 2) Copy and paste the page into a document editor (Microsoft Word, Google Docs, etc.) and print from there. How can I get another copy of the 1098-T? *Print directly from your browser and change the page settings to print in landscape orientation. * Copy and paste the page into a document editor (Microsoft Word, Google Docs, etc.) and print from there. Due to the Family Educational Right of Privacy Act (FERPA), only students may request 1098-T form reprints by contacting Student Financial Services at 336.758.5234 or sfs@wfu.edu. The University’s policy is to mail via the US Postal Service all reprint requests to the student’s permanent address on file. Did Wake Forest send a copy of this form to the IRS? Yes. Section 6050-S of the Internal Revenue Code, as enacted by the Taxpayer Relief Act of 1997, requires institutions to file information returns to assist taxpayers and the Internal Revenue Service in determining eligibility for the American Opportunity and Hope and Lifetime Learning education tax credits. Forms are mailed at the end of January of each year for the previous tax year, which runs from January 1 to December 31. Qualified expenses include tuition and certain fees defined by law. It does not include room, board, insurance, travel, parking or any other personal, family or living expenses. For information about qualified educational expenses, click here. What is the American Opportunity and Lifetime Learning Education Credits and what are allowable tuition and fee tax deductions for each? Click here for an overview of the American Opportunity and Lifetime Learning Education Credits and allowable tuition and fee tax deductions. Publication 970 explains tax benefits for education. Why do my payments for the year not match my records? Why are my 2018 payments not reported? In 2017 and previous years, WFU reported the amount of tuition and qualified expenses billed in Box 2. This is based on a calendar year (January 1 – December 31), and not an academic year. The most common source of confusion is that Spring tuition is billed November 1 and due December 1, of the year prior. So while the student attended in 2018, the tuition and qualified expenses were billed (and reported on the 1098-T) form in 2017. How can I get the account history for payments and billed charges? The electronic 1098-T (available on WIN) includes a detailed breakdown of debits and credits for each box reported. 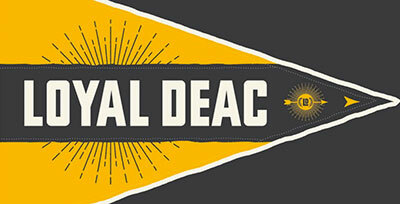 In addition, current students may access all previous statements on DEAC under View Student Account Detail. I am/was a student worker. Why is my pay not included? Income received as a student worker is reported on a W-2 tax form, issued by Payroll. Contact the IRS Tax Information Line at 800.829.1040 or your tax professional. 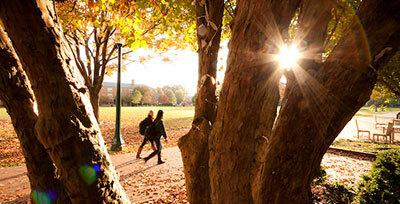 Wake Forest does not provide legal, tax or accounting advice to students, parents or authorized payers.